Jet Stream … The Eagles own a perfect 9-0 record against the Jets all time, which is the best undefeated mark between two teams in NFL history … The Eagles’ 45 points were the most against the Jets since they allowed 45 at New England on December 6, 2010 … The Jets came into the game with the league’s top red-zone offense, scoring touchdowns on 71.4% of their trips inside the 20-yard line, but were held to just two touchdowns on five red zone trips on the afternoon. Rushing into the Record Books … RB LeSean McCoy tied a career-high with three rushing touchdowns, surpassing Steve Van Buren for the franchise record for most touchdowns in a season (20) and most rushing scores (17). His 20 touchdowns this season lead the league and are tied for the 20th-best single-season total in NFL history, according to Stats Inc. … He became the third player in team history to have three straight multi-TD outings, joining Brian Westbrook (2004) and Ricky Watters (1995) … McCoy also posted his sixth 100-yard effort of the season, which is tied for the third-most in team history … His 1,274 rushing yards on the season ranks 5th all time in Eagles history and his 3,001 career rushing yards is the most ever by an Eagle in his first three seasons … McCoy has scored a touchdown in 13 of 14 games in 2011 … McCoy snapped a streak of 490 regular-season touches without a fumble. His last fumble came on 10/10/10 at San Francisco, and the last fumble he lost was on 10/3/10 vs. Washington. Babin the Beast … DE Jason Babin recorded three sacks for the second straight game, becoming the 10th player in NFL history to do so, and the first Eagle … He now has a career-high 18 sacks on the season, which is tied for the third-highest total in team history and the most since Clyde Simmons’ 19 in 1992. He is the 15th player in NFL history to reach 18 sacks in a season … Babin has had three-straight multi-sack games, and a trio of three-sack games in 2011. Magnum TE … TE Brent Celek had the second-highest yardage total ever by an Eagles tight end behind Pete Retzlaff’s 204 yards on 11/14/65 vs. Washington … His 156-yard effort included a career-long 73-yard catch, while also contributing his third touchdown of the season. It was his fifth-career 100-yard game … The Eagles own a 13-4 record when Celek scores a touchdown. Scoop and Score … DE Juqua Parker scored his third-career touchdown and his second fumble return for a touchdown this season. The only other defensive player in team history with two fumble return scores in the same season was Seth Joyner in 1991 … Parker is ranked 2nd to Clyde Simmons (4) for most touchdowns by a defensive lineman in team history … All three of Parker’s touchdowns have covered 47-plus yards (56-yard fumble return, 55-yard interception return, 47-yard fumble return). Defensive Nuggets … LB Jamar Chaney has three interceptions this season, which is the most by an Eagles linebacker since William Thomas had three in 1996 … DE Phillip Hunt has had a sack in two-straight games … In their last two games (both wins), the defense has held opponents to 6-28 (21.4%) on third down and 0-4 on fourth down. Forcing the Issue … The Eagles defense forced four Jets turnovers, including CB Asante Samuel’s 23rd interception as an Eagle, tying him for the 10th-highest total in team history. Samuel’s teams are 36-7 overall when he intercepts a pass and 26-1 at home (including playoffs) … Over the last two games, the Eagles have scored 38 points off of their seven takeaways. Offensive Quick Hits … WR DeSean Jackson’s 3,909 career receiving yards are the most ever by an Eagle in his first four seasons … WR Jeremy Maclin’s 176 career receptions are the second-most ever by an Eagle in his first three seasons (Keith Jackson – 194) … QB Michael Vick threw for 274 yards and a touchdown for a 107.0 passer rating, his second-highest of the season. 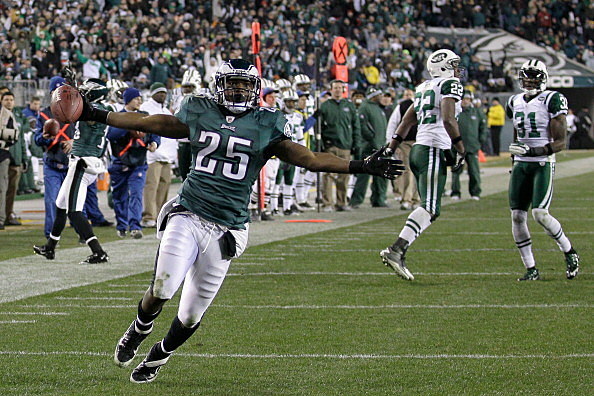 Vick also scored his 34th-career rushing touchdown (including postseason) and his 13th as an Eagle. The Eagles are 10-2 when he scores on the ground … The Eagles four rushing touchdowns tied for the fifth-most in franchise annals and the most since matching that total on 9/23/07 vs. Detroit. Spreading the Wealth … The Eagles offense features four players with 600-plus receiving yards this season, becoming the third Eagles team ever to do so (2006, 1990). Birdseed … Andy Reid won his 134th career game, tying former Jets head coach Weeb Ewbank for the 23rd on the NFL’s all-time list (including playoffs). He improved his career December record to 37-15 (.712) … K Alex Henery has connected on 12 consecutive field goal attempts, which is tied for the 7th-longest streak in team history … The Eagles tallied their 300th home victory in franchise history.